Killer Snails Demonstrates BioDive at Ed Lab! We were incredibly fortunate to have the chance to show our beta version of BioDive at Columbia’s EdLab. EdLab is a research, design, and development unit at Teachers College, Columbia University. EdLab envisions and pilots knowledge projects for a fundamentally different education sector that is attuned to the emerging post-industrial world. EdLab engages in work that has the potential to contribute to the improvement of educational institutions today and the broader evolution and reconfiguration of future educational services. Jessica happily describes the Killer Snails difference! About 30 people came to hear Jessica and Lindsay talk through the way we are developing our virtual reality experiences and the associated activities. We discussed our end goal, what we've created to date and how we were getting user feedback from both students and teachers on a semi-weekly basis. Please watch and let us know what you think! Almost ready for our close up! It’s hard to believe that this Friday marked our 11th week as Designers in Residence at the New York Hall of Science (NYSCI). While we’ve been lucky enough to spend a great deal of time in the halls before this experience, working with Explainers as they designed and prototyped their learning games was truly an extraordinary experience. As a quick recap, our four intrepid Explainers began the experience with the singular goal of making the exhibits even more engaging to museum visitors. Yuliya and Samantha drew inspiration from visitors engagement with digital media within the halls and worked to create a digital game to guide and extend visitor inquiry throughout each hall, beginning with the Search for Life exhibit. Sam and Yuliya used their experience interacting with visitors to turn their idea into gamified experience and are ready to start playtesting their first digital prototype (below)! Team Digital showing their new game! 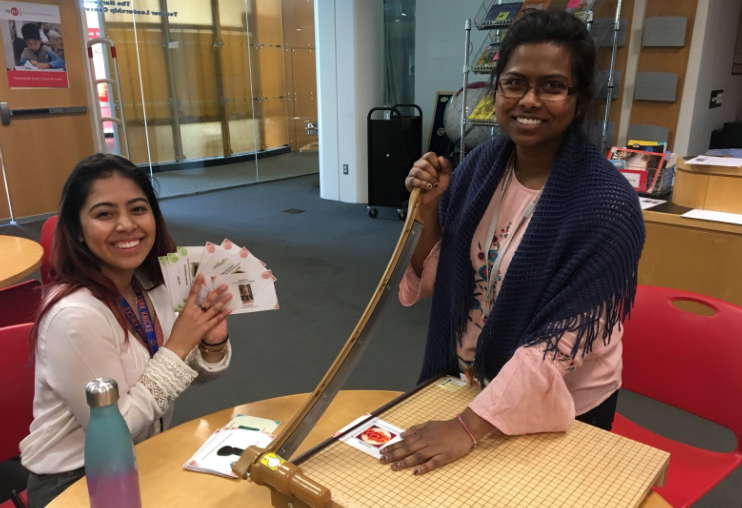 Kumari and Leah were inspired by the interconnectedness of multiple exhibits and set to work creating a tabletop game where players seek to identify attributes of items found throughout the museum. 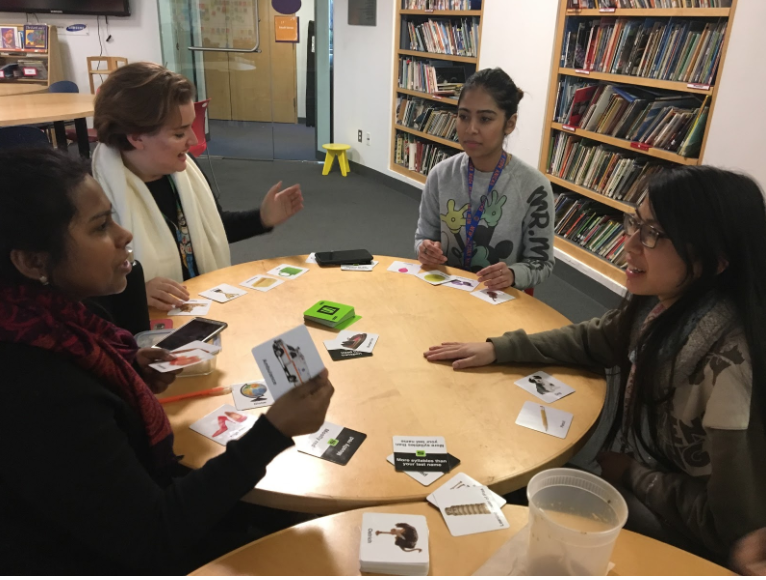 Using science savvy, game mechanics, and learning science they were able to scaffold the game to be both bilingual for Spanish speakers as well as able to meet multiple levels of players from novice to experts by both age and the number of visits. Having successfully play tested paper versions of their tabletop game team tabletop (Leah & Kumari) are creating a more solid prototype that they’re ready to continue play testing for user feedback (below). Team Tabletop preparing a new prototype! We’re almost ready for our close-up and would love to see all of you when we reveal these two exciting prototypes and the process behind their games at NYSCI next Friday at noon. Come hear from the brilliant Explainers and team Killer Snails about designing learning games to captivate science learners and who knows...maybe come up with a new game idea of your own? We hope to see you there! NSTA Recap: Ceilings that Leak and Friends so Unique! Fellow National Science Foundation SBIR grantees! This year’s NSTA National Conference in Atlanta brought together over ten thousand science educators from across the country and Team Killer Snails was lucky enough to spend time with friends both old and new! 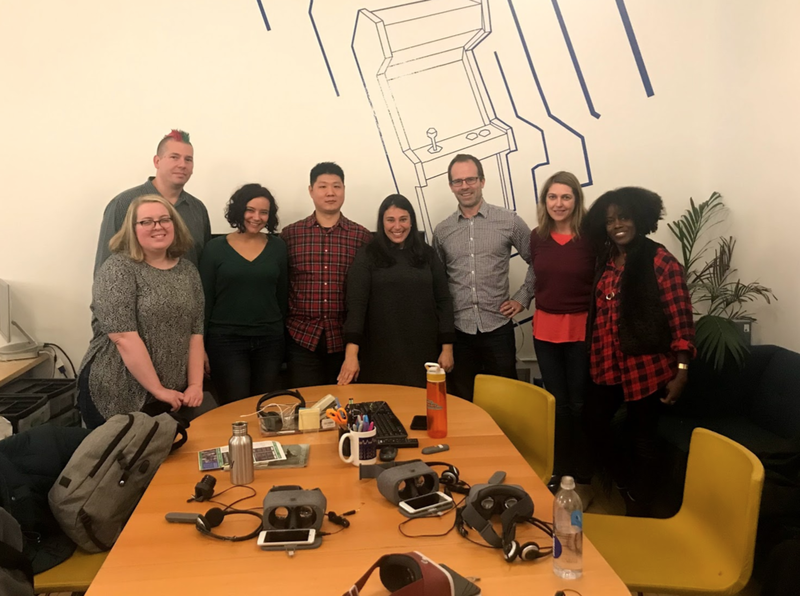 Our first day included a wonderful reunion with friends from The PocketLab and NeuroTinker, two fellow NSF SBIR grantees whose games are bringing learning out of the lab and into the hands of students worldwide. Throughout the conference we met with science educators from across the country and learned a few new tricks too. We learned from industry titans like NOAA whose educator Stephen Zepecki gave a talk about three tools for making weather data approachable and engaging in the classroom and folks from Vernier who demoed their tools for making force visible. Delighted to see so many awesome attendees! Imagine our surprise when we discovered that our neighbor was Chris Kessler of Kessler Science fame, and our delight when Diana Allen, of Maine NSTA President & infographic fame and Tom Robertson of Explore Learning descended upon our booth for a visit! Learning from the ceiling leak! Science expertise was on parade at the expo with the folks behind @NGSSphenomena not missing a beat to question the structure, function, scale, and system of the tarp that would later render the exhibitor hall uninhabitable due to an indoor rain storm. The ceiling leak became even more epic thanks to the PocketLab sensors (that also did a stellar job of graphing data from NASA’s Human Gyroscope). And OCEARCH’s own Lindsay Laughner came by to see our latest tabletop game, Biome Builder. We were all enamored by her gorgeous necklace by artist Brooke Kahnani whose art directly benefits OCEARCH. Another great conference is in the books for Team Killer Snails, we can’t wait to see our friends again soon. Until then, you can come play our latest VR adventure with us at the New York Hall of Science this Wednesday from noon until 7 p.m.
Lead Game Designer Noelle is waiting to greet attendees! Attending Toy Fair was an amazing experience for Team Killer Snails! We were fortunate to be in the Launchpad space where we were near many other awesome companies- including game companies, indie fan book publishing, empathy building resources and more! Matthew Meatball was across the aisle from us and tossing the Meatball back and forth was a great wakeup activity each morning. Matthew Meatball teaches children about empathy- a fantastic anti-bullying resource created by a teacher from Georgia! Holly Preston is the founder of A Fan for Life which was the colorful booth across from us- the lovely Canadian family was quite popular with the hockey and football books created for loads of teams. Holly and Marcela in their lovey booth! We really enjoyed learning about Sylvia’s math game SMS = Infinity which includes multiplication, division and memory. She is a 15 year teacher from Maryland who has created a tabletop and a digital version of the game. Sylvia with her three products! Math 4 Love offered two games that were both highly engaging and developed by former math teachers. Having never attended previously, we weren’t sure what to expect and it was a bit overwhelming- we are still not sure we were able to see all the exhibitors. However, one of Jessica’s favorites was the PonyCycle- a ride on animal that the rider powers by bouncing up and down- and yes, it is available for adults! CoFounder Jessica found her favorite toy! After the four days were over, Team Killer Snails left feeling excited to build new relationships with the many people we met at Toy Fair and we're already looking forward to next year! Storyboarding a digital scavenger hunt interface! A big part of completing a project successfully lies in planning the path. Today at the New York Hall of Science, the Explainers and Killer Snails started the day by discussing the topics we had covered during our first month: Science Communication, Intentional Learning, Game Design and Game Development. We revisited the prototypes that the four Explainers had created with us for both a tabletop game similar to Slapzi and a digital scavenger hunt style game. After a brief discussion, our four Explainers divided up into two groups- Team Tabletop and Team Digital. We spent the next hour working together to create a Google Spreadsheet starting with our end goal- two polished prototypes to exhibit on April 20th at the culmination of the NYSCI Designers in Residence program. Working from that date, we made a plan for all the steps needed to be taken during the next two months including: gathering visuals, making paper prototypes, iterating through playtesting, practicing the presentations with other Explainers and detailing what departments at the museum would need to sign off on particular aspects. By the end of the day, Team Tabletop and Team Digital had a clear plan and an associated Killer Snails team member to mentor them in each topic! 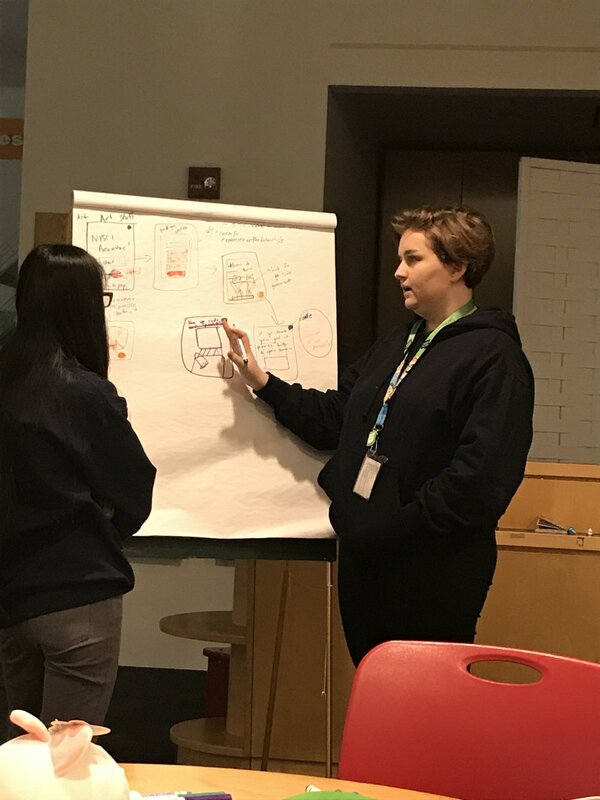 The two teams began storyboarding and listing the exhibits they needed to visit together and what work they would accomplish during their own worktime at the museum. We are so excited to see what they have produced by next week! Earlier today our lead programmer Christopher Pollati and I (Noelle Posadas) had the privilege of speaking with our NYSCI Explainers about the ins and outs of game development. 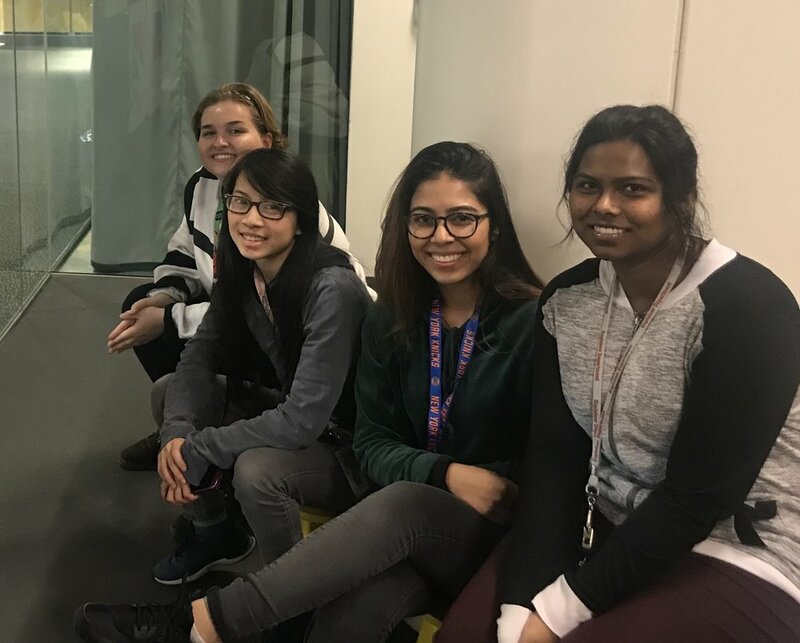 These young women came prepared with questions about what it takes to join the world of game development and we offered our years of experience as examples of how to break into this competitive industry. As someone in the game industry, I love to offer my experience as an example of how someone with a non-conventional background can become a game developer. All of our Explainers are currently studying various science disciplines in college, but are all interested in game development. I graduated from Pratt Institute in 2010 and wanted to become a children’s book illustrator, but after graduating I fell into a career as a 2D artist at a mobile game studio and eventually progressed into a UI/UX designer and now I’m the award winning game designer of Biome Builder (COUGH COUGH BRAG). I want our Explainers and every other young person in college struggling to make their degree into a career to know that you don’t need all the answers now, that your degree should never act as a block from doing what you want. I also strongly suggest to anyone considering a career in games to reach out to their local gaming communities. Here in NYC we are lucky that there are wonderful groups like Playcrafting, General Assembly, and IGDA that provide classes and networking opportunities. Even though Chris always knew he wanted to do game development, he didn't take a super direct path; he transferred colleges and majors along the way. After graduating from college, Chris found himself working at a variety of educational, graphic design, and then finance companies before going back to school. He switched schools three times before graduating Bloomfield with a Game Design Programming major. He loves it so much he has been teaching students to be game developers at Bloomfield for nine years now! Chris and I also had the opportunity to explain different types of games, not just digital and tabletop, but interactive play (i.e. Hide and Go Seek). So often when we think of games we think of experiences that happen on a screen or over a game board, but so many of the first games we play involve little more than a group of friends and an environment. After discussing a few of our favorite interactive games like Sardines and Manhunt we brainstormed ways of making the museum an interactive play space. Hopefully this session will help to inform our DIR project and become an interactive way of connecting the exhibits in our favorite museum, the New York Hall of Science. Exhibits + Games + Venom + Ira Flatow @Science Friday = An amazing week two as Designers-in-Residence at the New York Hall of Science (NYSCI)! In a whirlwind day, Explainers heard from marine biochemist Mandë Holford, cognitive psychologist Lindsay Portnoy, played learning games, continued to map the museum, and ended the day with a prototype of our very first co-created game. The Explainers started their day learning about the extreme creatures of nature that inspired the work of marine biochemist and Killer Snails Chief Science Officer, Mandë Holford. Watching a video of the cone snails hunting elicited a slew of inquiries from the Explainers: How were these creatures discovered? Do all cone snails hunt in the same way? Can they hurt humans? Are scientists trying to make medicines that numb pain? With more questions than answers, Dr. Holford explained how different cone snails make different venom cocktails and characterization of the peptides in the venom cocktails are what scientists are using to create palliative treatments like ziconotide (Prialt) and a newly discovered recently patented peptide by the Holford lab. Explainers were eager to learn more about how these deadly snail assassins can create an incredible mashup between biology and chemistry fueling Holford’s scientific inquiry. The discussion turned into a series of eager inquiries as Dr. Holford explained how venoms vary from poisons: Venom is transmitted when you are bitten, whereas poisons are transmitted when you take a bite of a deadly creature. For example, the cone snails use a radular tooth to harpoon venom into their prey the prey is bitten. In contrast, a newt’s poison is ingested by an unfortunate predator like this frog who takes a bite of the rough-skinned newt despite the newt’s attempt to warn predators with his red underbelly. After launching us into a fun game of “Bite or Bitten?” Holford left to share this new way of explaining venom versus poison with NPR’s Ira Flatow on this week’s episode of Science Friday. 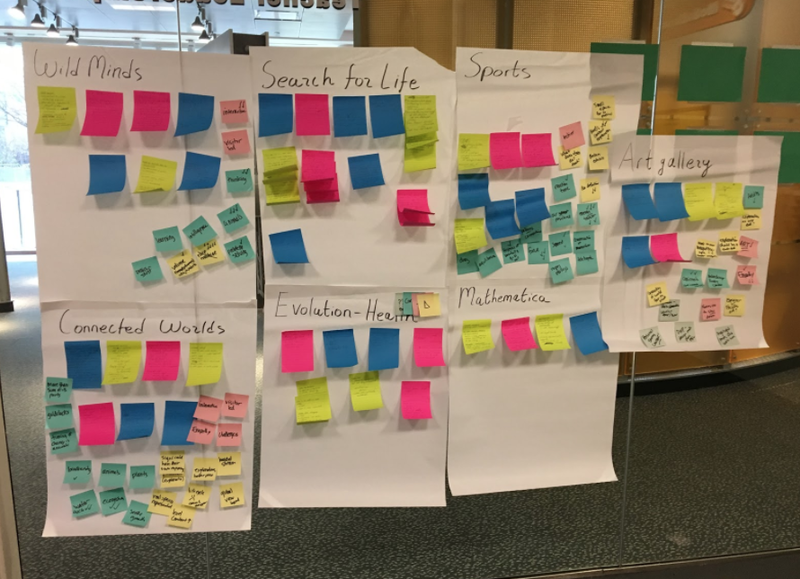 Last week, the Explainers and the Killer Snails team identified different ways exhibits from Sports to Connected Worlds work to engage visitors. The Explainers noticed crossovers in the content found in various exhibits such as the similar landscapes in Search for Life to that of the Connected Worlds. Revisiting the content in our map this week launched the group into a discussion about how the physics in the Sports exhibit is deeply connected to the content in Mathematica. Together, we revised and honed our huge concept map and headed to lunch with our cognitive wheels still turning. After lunch, team KS shared some favorite games with the Explainers including our latest game Biome Builder. After playing a few different games Explainers launched into a lively conversation with Dr. Portnoy about how games are a perfect canvas for learning. Together we explored how the game mechanics, or ways in which players interact with a game, can help teach content. For instance, the climate change card in Biome Builder forces players to move their hand of cards to the player on their left, demonstrating the forced migration as a result of a change in climate. Inspired by mapping interdisciplinary science across the museum and game play, team KS and the NYSCI Explainers had a eureka moment and launched into a fast and furious game design experiment. Weaving together the many exhibits shed light on new ways to show the interconnectedness to visitors. For the rest of the afternoon we worked together to co-create and play the first prototype of a fast-paced and hilarious game connecting the myriad exhibits at NYSCI. By the end of the day the Explainers were uber proud of their incredible work translating science and learning into a prototype for a new game. Stay tuned to see how our draft game plays out in week three when Killer Snails designer Noelle Posadas and developer Christopher Pollati work with Explainers to bring our new science game to life! Mapping Microbes, Migration, Mathematics, and more…. On Friday, team Killer Snails spent the day with four extraordinary Explainers from the New York Hall of Science (NYSCI) as we launched our Designer in Residence program. Together we walked the halls of NYSCI, moving from exhibits such as Search for Life to Wild Minds and everywhere in between! We spent our time together documenting all of the interactive experiences and rich science on display at NYSCI while looking for opportunities to make the exhibits even more engaging to visitors. Samantha (left) and Leah (right) show off their brawn and their brains racing and talking about aerodynamics and speed while Yuliya (left) and Kumari (right) take note of the engaging aspects of this exhibit. The Designers-in-Residence (DiR) program has been created to infuse innovation and current design principles, thinking and insight into NYSCI’s Science Career Ladder. During their residency, DiRs will participate in public programs and be paired with a small group of two or three Explainers. DiRs come to NYSCI to engage with museum culture, explore our resources, and work with their Explainer partners. The goal of the program is for the DiR and Explainer teams to test ideas with the public, develop new work or new components of existing projects, and introduce different perspectives into the way NYSCI presents information and engages with our multiple publics.The four stellar Explainers who will be working with Killer Snails include: Yuliya who is a Physics major at City College, Kumari who is studying both biochemistry and psychology at Hunter College, Leah who is double majoring in Law and English at John Jay College, and Samantha who is studying biology and art at Hunter College. The friendly folks at NYSCI were all so warm and welcoming. During the day we met many new faces including Wren, a science researcher at the museum who taught us about bird tubes used by scientists studying migratory birds. Our peek into the 3D theater introduced us to Monte Melnick (above), who supervises all the audio visual needs for NYSCI, and who is a a celebrity in his own right as former tour manager for 22 years for the Ramones as well as the generous donor behind the World’s Fair exhibit which displays his own tickets and paraphernalia from the historic event. Monte even invited our crew on a behind the scenes tour of the theater complete with a visit to the studio to see how 3D films are shared with NYSCI audiences. Sharing notes and ideas for the exhibits at the end of the day. We ended our day with a thoughtful analysis of the exhibits we had visited as seen above. We can't wait until next Friday when we continue our work alongside NYSCI Explainers and together build new ways of engaging visitors through play. An Engaging Family Podcast Featuring Biome Builder! Our beautiful, treasured trophy from the Boston Festival of Independent Games! Team Killer Snails is working at a breakneck speed to bring our latest Virtual Reality game BioDive to life. Earlier this month we successfully demoed the inaugural scene at the ED Games Expo and since then we’ve been hard at work building out the next few scenes to share with teachers and friends at NSTA later this spring. 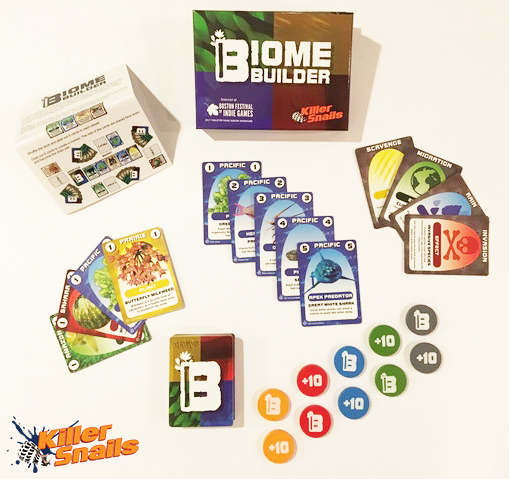 So imagine our surprise when we recently discovered our latest tabletop game Biome Builder was featured in a podcast from our friends at Engaged Family Gaming! Stephen Duetzmann hosts this podcast with the goal of giving “parents and families the information they need to get their family game on!” Stephen met KS team member Noelle Posadas at the Boston Festival of Independent Games (FIG) last fall where Biome Builder took home Best Tabletop Game. After playing the game, Stephen and his wife Jenna were smitten with this “super fun” game that is “perfect in elementary school classroom to reinforce what students are learning.” We are really honored that Stephen and Jenna enjoyed the game so much that they featured it on their podcast. We’re even more excited that they think that Biome Builder is “a game that on a high level reinforces how ecosystems and biomes work.” Mission accomplished! Do yourself a favor and check out this great podcast here. You can learn more about Biome Builder starting at minute 14 and also hear about an exciting new cooperative game Stuffed Fables with creator Jerry Hawthorne. Showing the Explainers some Killer Snails VR! We are thrilled that Killer Snails has been selected to take part in the very first cohort of Designers-In-Residence at the New York Hall of Science (NYSCI). 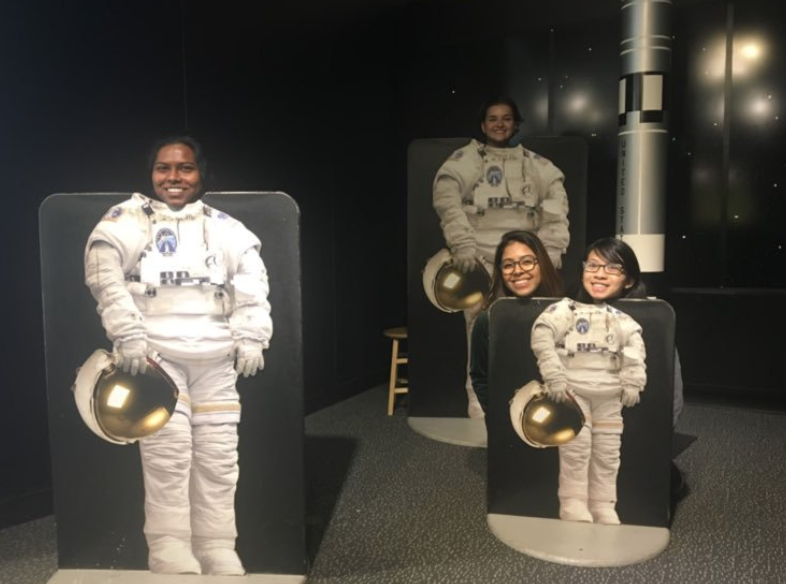 The program is a way to extend engagement within each of the museum’s exhibits alongside Explainers, the young women and men who guide visitors through their journeys at NYSCI. And starting this winter Killer Snails has the honor of working with four of these extraordinary Explainers as we create innovative new ways of looking at and engaging with some of our favorite exhibits at NYSCI. From game design to experiential learning, these Explainers have a passion for science learning and communication, and we are so excited to be working with them. From February through April, we will document the process of exploring and inventing novel ways of engaging with the museums exhibits. Together we’ll work to extend opportunities for visitors to engage with exhibits from Connected Worlds to Color Shadows and share our progress with you. Better yet, come join us! We’ll be at NYSCI along with the four stellar Explainers for three months starting on February 2nd. Come join us as each Friday from 11 a.m.-4 p.m. as we explore the exhibits and discover new ways of interacting with the diverse exhibits within these halls. Two awesome children diving into the ocean with BioDive! Electric Fun Stuff: Teachers know that student voice and student choice is key to making learning meaningful which is why Mission US is the Oregon Trail of our day! Players are cast in the role of young people who lived through extraordinary times during American History to make learning memorable. At the expo we were able to play in missions about both the Great Depression and the Revolutionary War and cannot wait to see what new missions they’ll be releasing in 2018 including some exciting new work in VR. Schell Games: The brilliant minds at Schell games have an exciting track record creating incredible digital and virtual reality experiences and Happy Atoms is an exciting hybrid of their work. This is the app I wish we had in high school chemistry! This experience links magnetic molecular modeling set to a digital experience where students can see what molecule they built how it fits into the world of molecules. Also shared was their VR chemistry lab SuperChem where players perform experiments in a safe and immersive environment. iCivics: Learning through applied practice is key to the success of iCivics games. Their new game Do I Have a Right places learners as lawyers specializing in constitutional law. In this game, players must determine if potential clients have rights, match those clients with the most qualified lawyers, and win cases to build their law firm. Never before have the Amendments been so relevant, exciting, and accessible! Molecular Jig: The immersive nature of virtual reality means that abstract concepts can be made concrete and processes that are nearly impossible to see with the naked eye are at once clear. This is what makes the virtual reality game Immune Defense so awesome. In this game we took the driver’s seat to see proteins up close and personal. Riding across the surface of a cell we could see first hand how the shape of proteins affects their behavior. Biochemist Melanie Stegman has definitely found her calling in creating exciting games that make otherwise abstract science approachable and visible. Issa’s Edible Adventures: Social studies meets math, science, and language arts in this interdisciplinary trip around the globe. We loved this digital game where we travel with Issa and her trusty sidekick Tartufo to international spots collecting ingredients to prepare a dish for a VIP foreign dignitary. Finally a digital game that shows how food is an exciting language that we all share. Filament Games: Remember planting seeds and eagerly watching them grow on your classroom window sill? In Reach for the Sun students apply their knowledge of plant growth to even broader topics of plant reproduction and pollination pairing the exciting growth of their classroom plant to issues of survival and resources. Alchemie: Chemistry teachers had many great tools to choose from at the expo including two from a former chemistry teacher! In ChirosVR middle and high school students are able to experiment with molecular construction while Connections and Isomers is a digital puzzle game that encourages learners to reach for the stars while they grow their dendrites! Thank you to our friends who came out to play the demo of our newest game BioDive and BiomeBuilder! 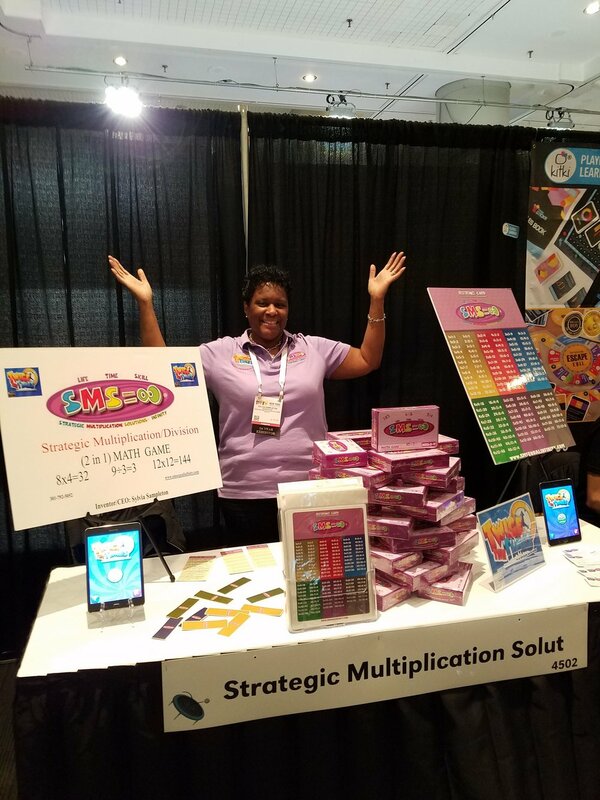 We missed our friends from Andamio and can’t wait to see what’s new with their games later this year when we meet up at the NSTA conference in Atlanta. Great group of people playing Biome Builder! 3. We met the awesome women of DolphinTank @lynnloacker & @SpringboardEnt and gained a new community of entrepreneurs! 4. Our new game #BiomeBuilder won best game @BostonFIG !! Our amazing game designer @DopeAtNope brought home the trophy! 5. We were named @nysci designers in residence and will spend Spring 2018 working with their awesome explainers on gaming and exhibitions... maybe even a new game! See more here! 7. We started a meetup for #VRinEducation to cultivate a community of learning game designers and educators using digital media to break barriers in the classroom and beyond. Our first @Meetup date is January 17. Come join the party! 8. We launched our first game “Assassins of the Sea” on @iTunes ! Now you take play anytime and anywhere! Killer Snails and Electric Fun Stuff! Demo at the Kennedy Center on January 8th! On January 8, KS is thrilled to go to the Kennedy Center for a day of demonstrating educational games! KS is bringing a virtual reality game, a digital game and a card game. Attending last year was a wonderful opportunity to meet many other people working in the learning space. We tried other people’s experiences and received feedback on our game too. 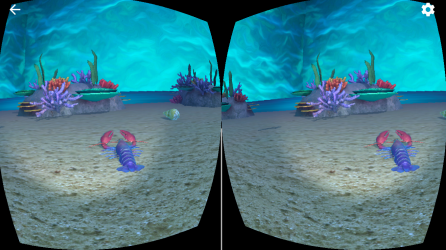 This year, we are incredibly excited to unveil BioDive, our prototype virtual reality experience! Hear our Chief Scientist talk Gamification on Tuesday! As our regular readers know, gamification is the process of taking something – a website, an app, an online community – and using game play to motivate and engage customers, and keep them coming back for more. Businesses in the education, marketing, sales, energy and health sectors have used gamification to increase engagement, and many others can benefit from it too. Our chief scientist, Mandë Holford is joining an interactive webchat on Tuesday, December 12 at 11:00 a.m. EST/16:00 UTC to discuss how using gamification can add value to your product and more fully engage your customers. She and the other two participants will answer your questions live! To participate in the conversation, visit www.gistnetwork.org/content/gist-online or submit your questions on Twitter by using #GISTTechConnect. The program will be in English with Spanish interpretation. Dr. Elena Bertozzi is an Associate Professor in Game Design & Development at Quinnipiac University. Dr. Bertozzi and her team have worked with scientists, artists and healthcare professionals on a variety of games that incentivize players to seek and achieve positive behavioral change. She has written extensively on gender, sexuality and technological self-efficacy. Motivated by her experiences in using games to address previously intractable problems, she studies ways in which interactive technologies can guide players towards better decision making based on accurate knowledge. She specializes in leveraging current technologies to produce low-cost 2D games that can be delivered over the most accessible device for the target audience. Dr. Mandë Holford is an Associate Professor in Chemistry at Hunter College and the City University of New York (CUNY) Graduate Center, with scientific appointments at the American Museum of Natural History and Weill Cornell Medical College. She is a World Economic Forum New Champion Young Scientist and recipient of the prestigious Camille Dreyfus Teacher-Scholar Award. Mande co-founded several initiatives including, KillerSnails.com, an award-winning learning games company that uses extreme creatures as a conduit to advance scientific learning, and RAISEW.org, a National Science Foundation (NSF) project to increase women in science. She also co-created the first Science Diplomacy course at The Rockefeller University to encourage early career scientists to think globally about the impacts of their research. She leads pioneering efforts in scientific research, education and policy. Joshua Mandell is currently an Adviser for Halcyon, a social enterprise incubator in Washington, D.C. that focuses on accelerating early stage startups solving 21st Century problems. Prior to Halcyon, Joshua served as a Senior Adviser for Innovation and Competitiveness to the U.S. Secretary of Commerce. Joshua was also the Science and Technology Program Officer at the World Bank Group focusing on building science and innovation capacity in the public and private sectors in lower and middle-income countries. Our Game Designer Speaks at Pratt! 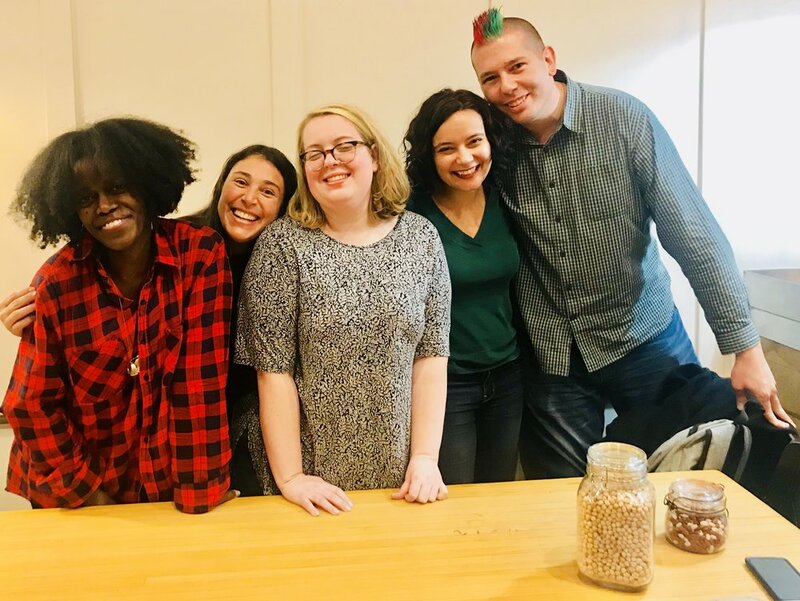 Our award-winning game designer, Noelle Posadas, gave a lecture yesterday at her alma mater to about two dozen current and former Pratt Institute students. Noelle detailed a bit about her past year with Killer Snails which included coming up with the idea for Biome Builder, play testing it with hundreds of students at locations ranging from the American Museum of Natural History to the New York Hall of Science before launching it on Kickstarter. One of the most important pieces of advice according to audience members were “what makes a good educational game is that the mechanics lead to learning”. The center for career resources at Pratt live-streamed the talk which will be available on their site next week here and we highly recommend it to all! We have been eagerly awaiting the arrival of our Biome Builder games from the manufacturer and they finally arrived!! Biome Builder looks lovely and we are so excited! So far, so good... boxes look nice! And then we were so excited!! Lindsay shows off our amazing new game! And now we will begin shipping out games to our Kickstarter supporters and pre-orders through our website! In the next couple of weeks, the game will be available on Amazon through Amazon Launchpad in time for the holiday season! Listen to Chief Scientist Mandë Holford on Science Friday! Trick or treat with Killer Snails & Playcrafting! Noelle and Adam (an honorary Killer Snail) are playing Biome Builder and handing out Candy at Playcrafting's Trick or Treat Halloween Game Expo! Not only can you play with the extreme creatures below (Narwhals and Sloths are awesome!) but there will be loads of other fun games to try as well. We will be there from 2pm-7pm! They may look innocent, but the Sloth and Narwhal are full of tricks! Biome Builder wins First Award! 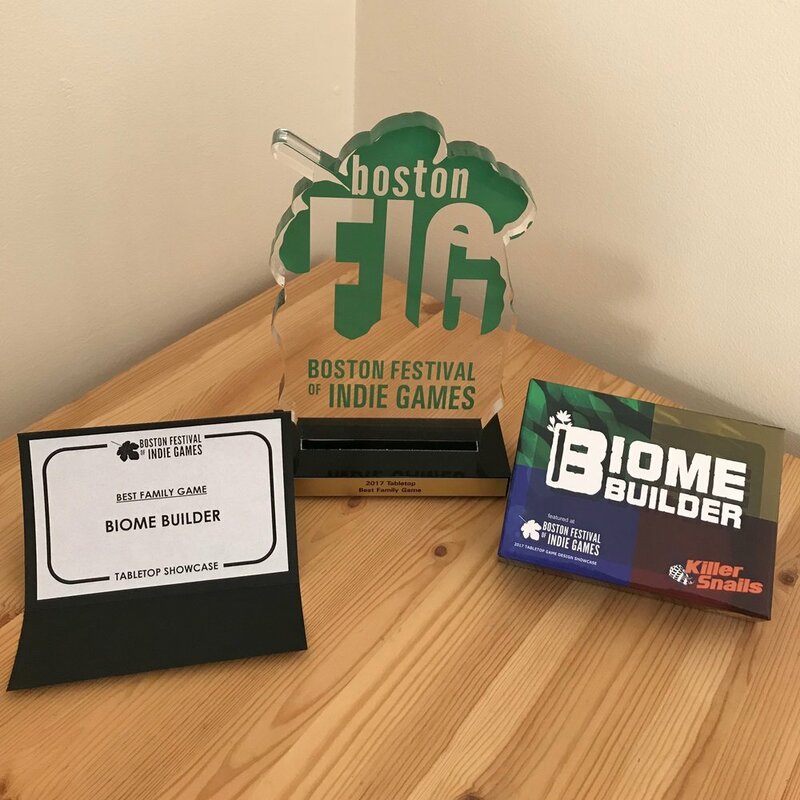 We are SO THRILLED to announce that Biome Builder won the Best Family Game at the Boston Festival of Independent Games! Last night we had the opportunity to pitch on Springboard Enterprises Dolphin Tank! Springboard Enterprise is a fantastic organization that offers unique events on topics useful to founders. The Dolphin Tank events give founders the opportunity to practice pitching and receive feedback in a friendly environment. We were incredibly fortunate to have the chance to pitch at Davis Wright Tremaine law firm and we were given great feedback by the panelists: Amy Millman, President of Springboard Enterprises; Heather Myers, Strategist Spark No. 9; Kay Koplovitz, Co-Founder & Chairman, Springboard Enterprises andManaging Partner, Springboard Growth Capital; and Jisoo Kim, Associate, Davis Wright Tremaine LLP. Not only did each of these women offer thoughtful feedback, but we also met many other fantastic people in the audience and we plan to continue these conversations!